Written by Bros. Justin Nixon, Jodi, A.J. Rodriguez, and Sean Dertinger. It was finally a dry sunny “rain delay” day in December when Allentown Chapter raked leaves for charity. A large contingent of 6 brothers and several advisors descended on Grandmom and Granddad Blew’s house to clear their yard and garden beds. After their yard was finished, Allentown went to Mom and Dad Blew’s house to work and enjoyed some lovely pizza afterwards. 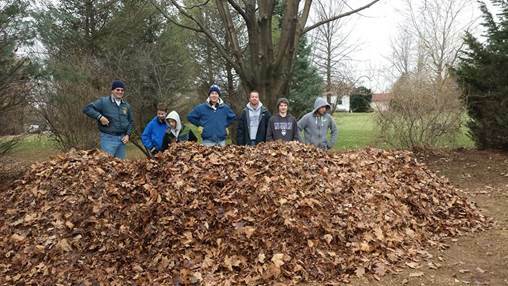 With lots of hard work, the crew managed to make a leaf pile as big as Jodi. Then a few brothers jumped in, it was a fun day! On a blustery Saturday morning in the Southern half of the Allentown Masonic Temple, Allentown Chapter and Easton Rainbow met for a lovely Saturday with Santa. The yearly event hosted by Valley of Allentown Scottish Rite create a festive atmosphere for local children in Allentown. A total of fourteen Masonic Youth helped run arts & crafts tables and enjoyed a performance by a magician with the kids. Everybody sang Christmas Carols and finally got a collective picture with Mr. & Mrs. Claus! This entry was posted in News and tagged AASR, Allentown. Bookmark the permalink.